"US wartime use of the defoliant Agent Orange in Vietnam remains an issue between the two countries." This astoundingly casual statement should arouse curiosity: What are the current facts on the ground that would cause wartime aerial spraying of Monsanto's Agent Orange, which ended 38 years ago, to remain an "issue"? And why didn't Senator McCain pledge to use his power as a United States senator to help resolve this issue in some reasonably equitable manner? During what the Vietnamese refer to as the American War, local hearts and minds were "won" by American military forces through aerial spraying of herbicides that were identified by the color of 4-inch bands painted around their 55-gallon drums. Agent Orange has by far received the most attention, but five other herbicides also were used. Agent Blue contained cacodylic acid, an arsenic compound, and was sprayed at the behest of a South Vietnamese president who thought poisoning his own people was a good thing because they were his enemies. The American military obliged the President by intentionally spraying the people America was supposed to be defending from evil Communists. Over a period of nine years, about 1.2 million gallons of Agent Blue were sprayed on rice paddies in an attempt to starve and poison South Vietnamese civilians. Agent White was a 4:1 mix of 2,4-D and Picloram. Agent White was contaminated with hexachlorobenzene and nitrosamines, both known carcinogens. Agent Pink was used during early stages of Operation Ranch Hand, before 1964. The only active compound was 2,4,5-T, which was contaminated with dioxin, at that time the most toxic man-made substance known to mankind. Agent Purple consisted of a combination of the herbicides 2,4-D and 2,4,5-T. Agent Purple is alleged to have contained 45 parts per million dioxin and was only used between 1962 and 1964. Agent Green was also used only during that period. Agent Green's only active ingredient was 2,4,5-T, presumably with similar dioxin contamination levels. All six herbicides were defoliants, used to destroy food crops and to clear jungles, mangrove swamps and forests of foliage, the better to see while dropping bombs on defenseless villages. For years the Pentagon admitted that, during 9-plus years of Operation Ranch Hand, about 19.4 million gallons of Agents Blue, Orange, White, Pink, Purple and Green were sprayed on slightly over 30,000 square miles, about 24 percent of South Vietnam. In 2006 scientists at Columbia University discovered documents that indicate over 2 million gallons of herbicides were sprayed between 1962 and 1965 that were not included in totals provided by the Pentagon and relied upon in earlier studies. Based on detailed analysis of flight records and available population data, the 2006 Columbia study estimated that 20,585 towns and villages were within spraying regions. As many as 4.8 million civilians could have been present in those towns and villages while spraying operations were conducted. The mightiest and most powerful and fearsome military force ever assembled by mankind made war against millions of unarmed and defenseless civilians, predominantly women, their children and the elderly, in the country they were supposedly protecting and supporting. Agent Orange was by far the most widely used defoliant. During that nine-plus year period, approximately 11.7 million gallons of Agent Orange, a 50-50 mix of the herbicides 2,4-D and 2,4,5-T, was sprayed on South Vietnam. Because of time and money-saving shortcuts that resulted in insufficient heating during manufacture, the 2,4,5-T was contaminated with 2,3,7,9-tetrachlorodibenzo-p-dioxin, or simply dioxin. The dangers of Agent Orange became known in 1952, nine years prior to the onset of use in Vietnam, when Monsanto Chemical warned the Army that 2,4,5-T was "contaminated by a toxic substance". This was confirmed in 1965 through a study of involuntarily exposed and uninformed inmates at Holmesburg state prison in Philadelphia. The progress of their resulting cancers was monitored and studied but no treatment was offered or provided. The Holmesburg report and subsequent confirming reports all were hidden. Millions of Vietnamese and a quarter-million American soldiers were exposed. As in the 1991 Gulf War, Pentagon brass used chemical weapons of mass destruction on civilians in violation of Geneva Convention rules of warfare, prevented all independent efforts to study their horrific effects and refused to acknowledge existence of overwhelming evidence of those horrific effects. For over 50 years the Pentagon has evaded the truth and deceived the public by claiming Agent Orange was harmless. EPA has a slightly different outlook. Pursuant to the federal Safe Drinking Water Act, the EPA established a maximum contaminant level goal of dioxin in drinking water of zero. The maximum contamination level allowed is 0.00003 parts per billion. For many years the Pentagon claimed an Agent Orange dioxin contamination level of three parts per million. Independent testing has established average contamination levels of about 13 parts per million. That is 425 million times the concentration allowed in American drinking water. Granted, very few if any people actually drank Agent Orange. But, conservatively assuming 2,500 drops per pint, one drop of Agent Orange accidentally ingested would result in the intake of the same amount of dioxin as would be contained in 21,250 gallons of drinking water which meets federal standards. A person would ingest the same amount of dioxin in one drop of Agent Orange as he would ingest by drinking 2 quarts of conforming drinking water daily for over 116 years. These comparisons illuminate the very real possibility that substantial numbers of Vietnamese villagers might well have suffered from Agent Orange poisoning. Soil contamination examples are similar. One example: Over 30 years after spraying ended, soil at the Bien Hoa former military base had Agent Orange contamination at 180 million times EPA's maximum safe level. Today, at least one million and perhaps as many as three million Vietnamese suffer serious health problems as a result of countrywide spraying of Agent Orange. That number includes about 150,000 with serious birth defects, including spina bifida, severe retardation, blindness, tumors and grotesquely deformed or missing limbs. For the caretaking parents of these children, the war never ended. For these children the war never will end. 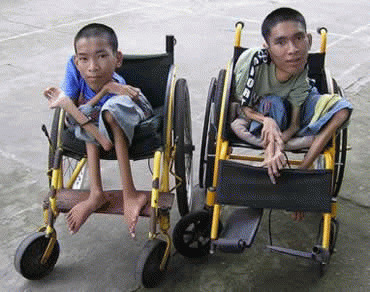 In the village of Cam Nghia for example, one child in every ten is born with serious defects. That ratio understates the problem because about 30 percent of village pregnancies terminate by miscarriage or stillbirth. The war was allegedly fought to prevent Vietnam from "going Communist". On April 30, 1975, over two years after the last American fighting forces were removed from the country, the last remaining Americans were evacuated from the roof of their embassy by helicopter as masses of North Vietnamese troops entered the northern sections of Saigon. Without an American presence, a unified Vietnam rebuilt their war-devestated country. The American government called this an act of an evil communist society. The Vietnamese called this a demonstration of solidarity, with everyone unselfishly helping everybody else. A unified Vietnam transitioned with a communist-style government for 11 years. Left to their own devices without American interference or influence, Vietnam then freely chose to move to a western-style free-market economy in 1986. Since 1986, while the American economy has remained stagnant for all but the richest, the Vietnamese economy has grown dramatically. For several years they recorded 20 percent annual growth rates for the export of goods produced by local companies listed on the booming Vietnam National Stock Exchange. Vietnamese investors own stocks of businesses in one of the fastest growing economies in the world. Unfettered free market capitalism. Some Americans recognize the sickening irony of the Vietnamese people of their own volition and without American influence doing exactly what America tried to force down Vietnamese throats, via support of what was at the time widely recognized as being the most corrupt government on the face of the earth. Today, American companies like VISA and American Express sponsor floats in the annual parade celebrating victory over American forces in Saigon, now called Ho Chi Minh City. That parade passes down Hong Thap Tu, past the site of the former American Embassy, which was razed. or "deconstructed" in militaryspeak, over ten years ago. Being American-style capitalists, the Vietnamese people attempted a capitalist solution to obtain redress for damages caused by America's illegal use of Agent Orange. In January, 2004 the Vietnam Association for Victims of Agent Orange filed suit in the US District Court for the Southern District of New York against Monsanto, Dow Chemical and eight other manufacturers of Agent Orange. The suit was dismissed early in 2005. The judge ruled that plaintiffs had failed to show that any domestic or international law had been violated. In March of this year, the Supreme Court refused to hear plaintiff's appeal. "Dioxin contamination... is harmless and causes no serious health problems or serious birth defects." The Pentagon has also steadfastly refused to acknowledge harm caused to a quarter-million American soldiers who were exposed to Agent Orange in Vietnam. In 1991, Congress authorized financial assistance to these wounded veterans. The Pentagon and the Veterans Administration responded by calling the link between Agent Orange and health problems "presumptive" and refused to pay legitimate claims. Only 1,800 claims, for 0.72 percent of the number of veterans who came into contact with Agent Orange filed have been approved for payment of compensation to American vets for the adverse effects caused by exposure to Agent Orange. To this day the American government is financially able but morally unwilling to fairly and honestly accept responsibility and compensate and support its patriotic wounded and disabled veterans for the damage the Pentagon knowingly and willfully caused. The Pentagon refused to perform the necessary studies and prevented others from doing them. And war-ravaged Vietnam had no funds to do studies. Partially because in 1975 America vindictively imposed a Cuban-style economic boycott on a unified Vietnam as punishment for winning the war. American efforts concentrated on oppression and continuation of suffering. One example: India attempted to provide 100 water buffalo, to replace a small part of the buffalo population deliberately killed during the war by American soldiers. America objected and threatened to cancel Food for Peace aid. The trade embargo was finally ended in 1994, 19 years after America lost the war. Diplomatic relations were established in 1995. Legally established liability or no, America has, for the past 20 years, graciously provided funding for disabled Vietnamese citizens. During that twenty year period, America has provided 46 million dollars. Assume this money was used only to support the estimated 150,000 Vietnamese born with birth defects. The financial assistance so graciously provided by America would result in a monthly benefit of 1.28 cents per child. One point two-eight cents per month per child. Fifteen cents per year per deformed child for damage America illegally and intentionally inflicted on defenseless women in violation of Geneva Convention rules. For lifelong damage intentionally inflicted upon the innocent children of the people America was supposed to be supporting. I say to Senator McCain, the accompanying photos depict but three examples of the "issue" you so casually referenced in your speech. Senator McCain, I say stop trying to count the number of houses your wife owns long enough to open your eyes and see what you condone by refusing to use your senatorial powers to assist these innocent children. Refusing to do anything at all. I say look and consider: One point two-eight cents per month. I say the fact that you, as a United States Senator with power of leadership that could bring about partial atonement for this terrible injustice committed against innocent children, casually tossed this comment out without hanging your head in shame conclusively establishes that you don't have the moral authority to serve as the Hooterville assistant street sweeper, let alone as a President of the United States.